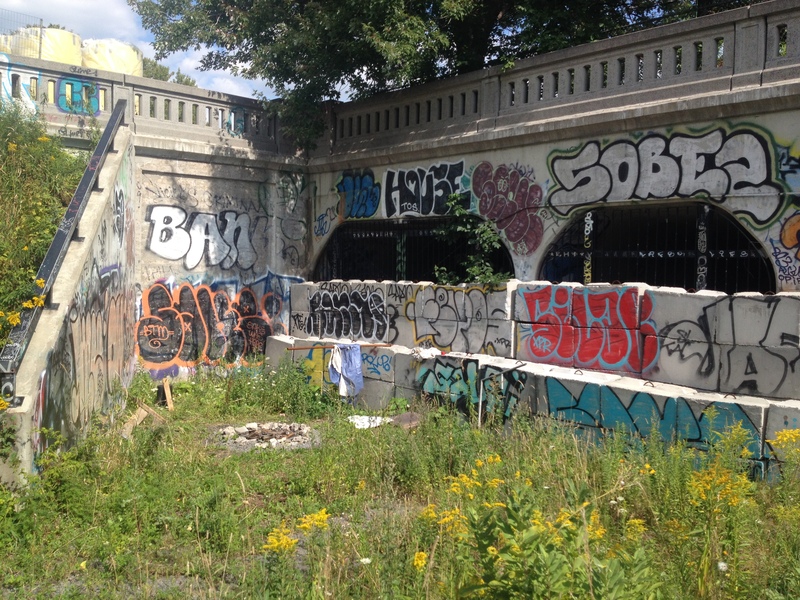 Participants exploring the rich urban flora growing next to the ruin of the nineteenth-century Crathern and Caverhill Warehouse. 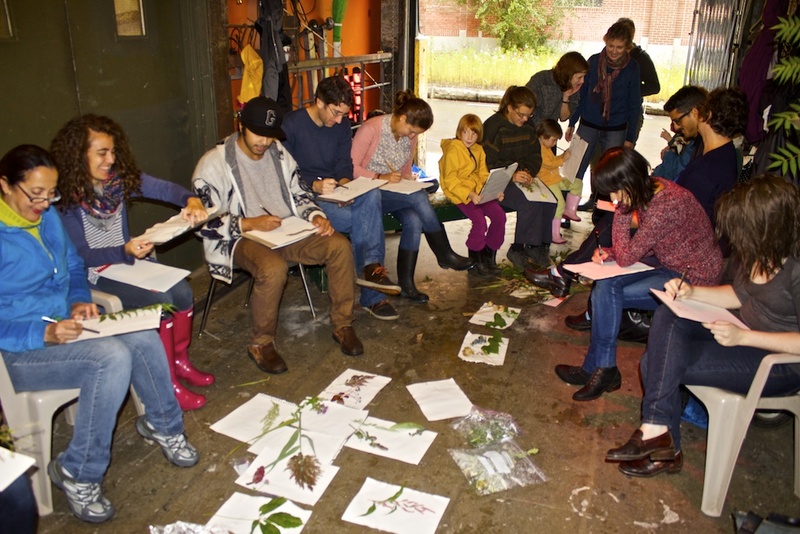 Despite the rain, approximately twenty-five people came out to participate in our fourth and final urban lab, Verdissement urbain. The event was curated by Noémie Despland-Lichtert in collaboration with guest experts and artists Jessica Hart and Roger Latour. 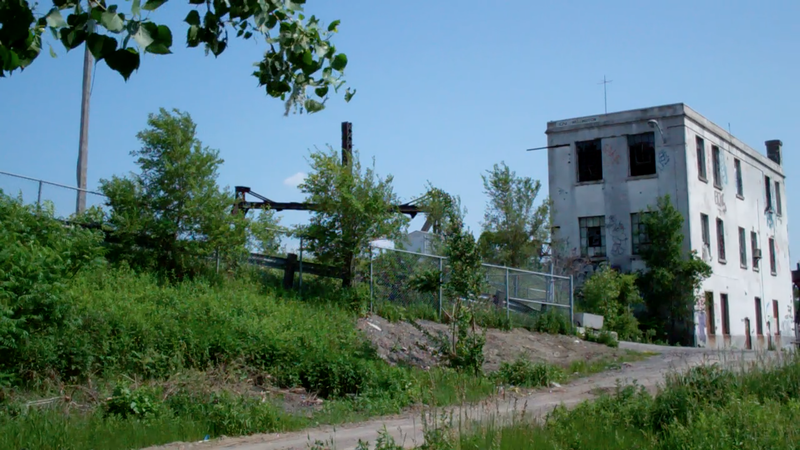 The goal of this workshop was to introduce participants to the ecology of informal green and self-seeding spaces that thrive in Montreal’s post-industrial landscapes. 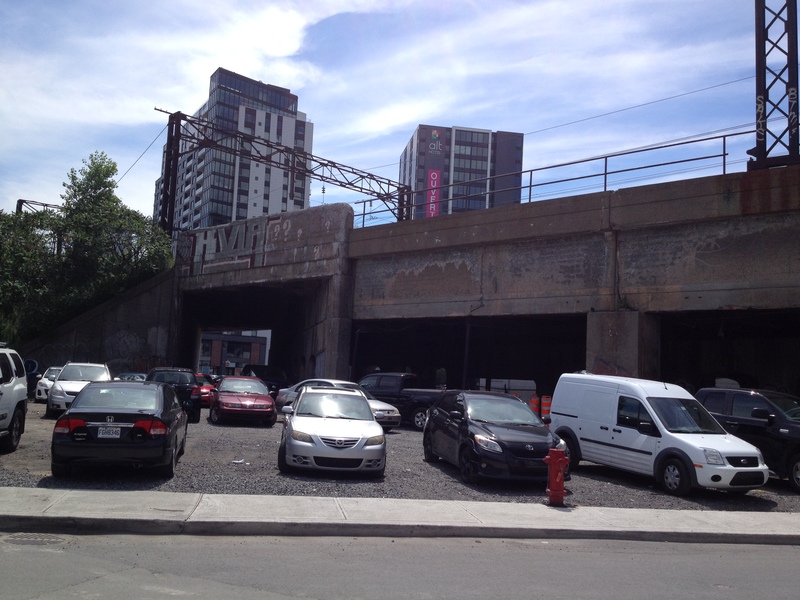 Participants gathering in parking lot at the corner of Prince and Wellington. Photo: Cynthia Hammond © 2014. 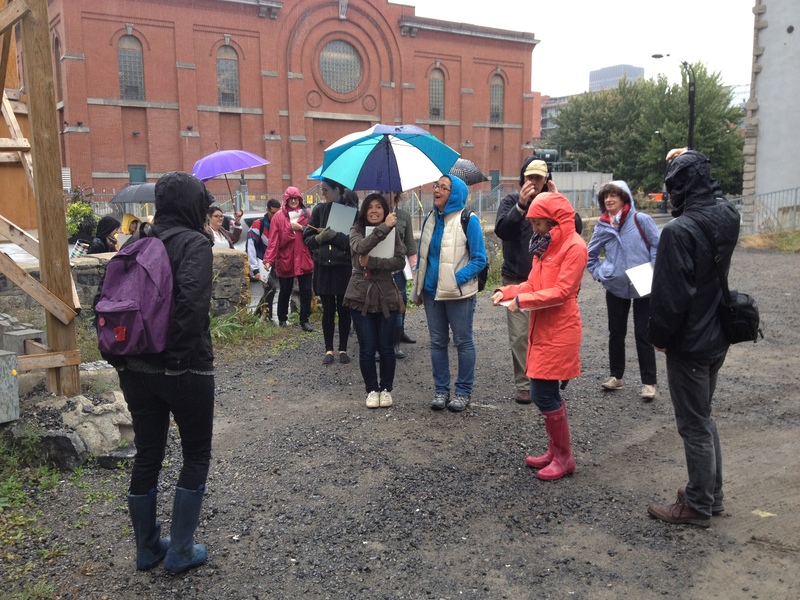 Armed with umbrellas, gumboots, scissors and more ziplock bags, our experts led us on a tour through the rich diversity of urban flora that presently grows throughout many of Griffintown’s interstitial spaces. 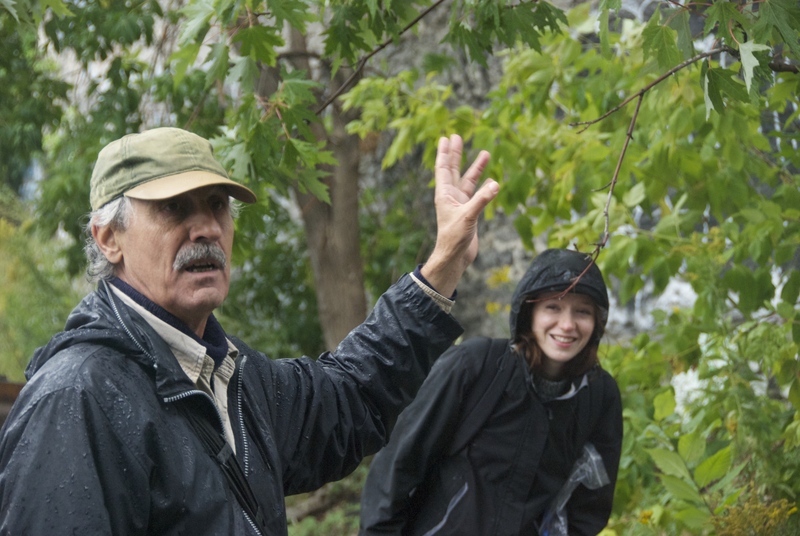 Participants were asked to take clippings throughout their walk. 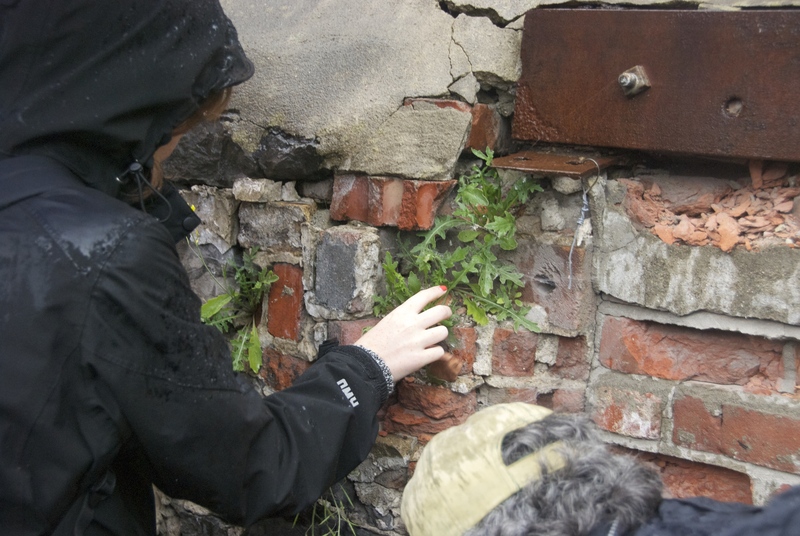 Some participants even discovered arugula growing out of an old stone wall! Noémie and Roger discovering arugula! Photo: Shauna Janssen © 2014. Roger and Noémie! Photo: Shauna Janssen © 2014. 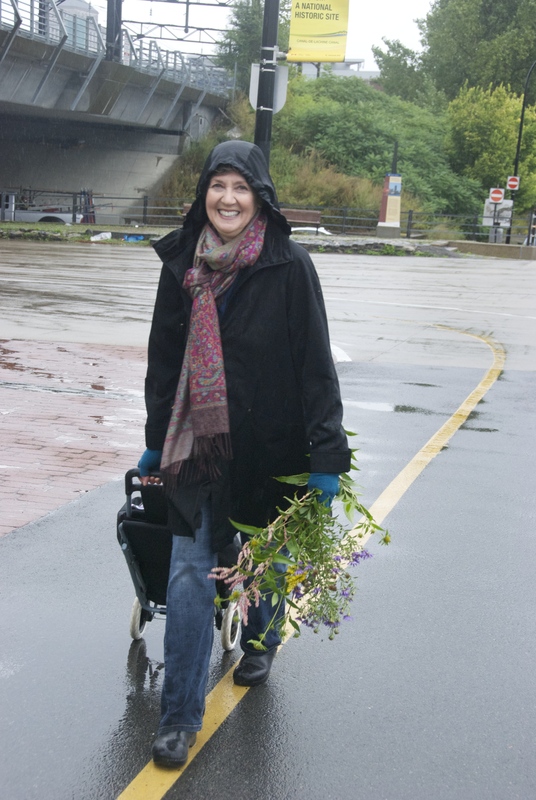 Jessica Hart on her way to the Wellington tower with her specimens for a future art project. Photo: Shauna Janssen © 2014. 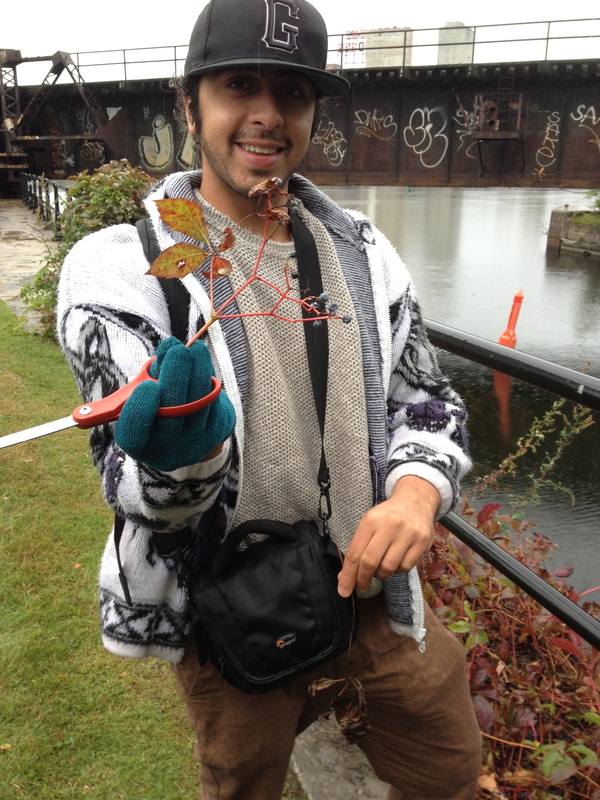 Nima with his edible specimen! Photo: Cynthia Hammond © 2014. Back at the Darling Foundry, we used the garage as a meeting place to continue the workshop – thank-you Mariko for providing us with a dry and warm place to continue our activities! And thank-you Cynthia and Tom for doing a tea/ coffee/ hot chocolate run! 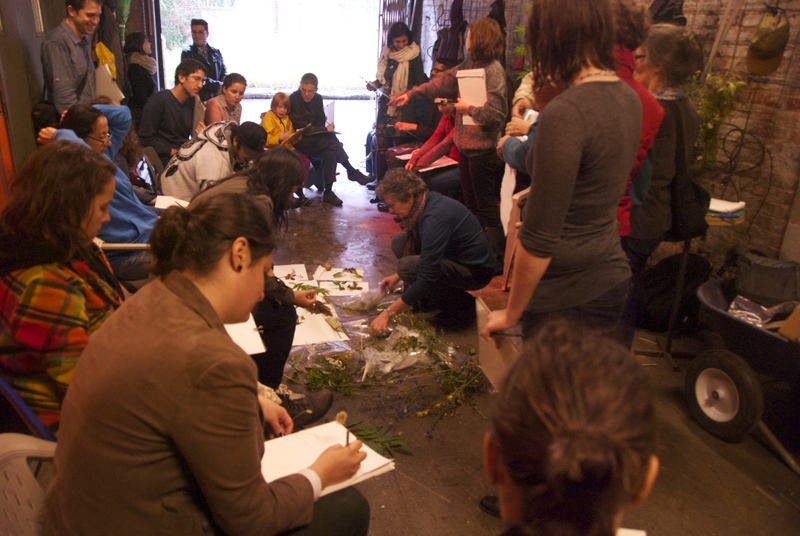 Participants huddled together and shared their collection of plant clippings. 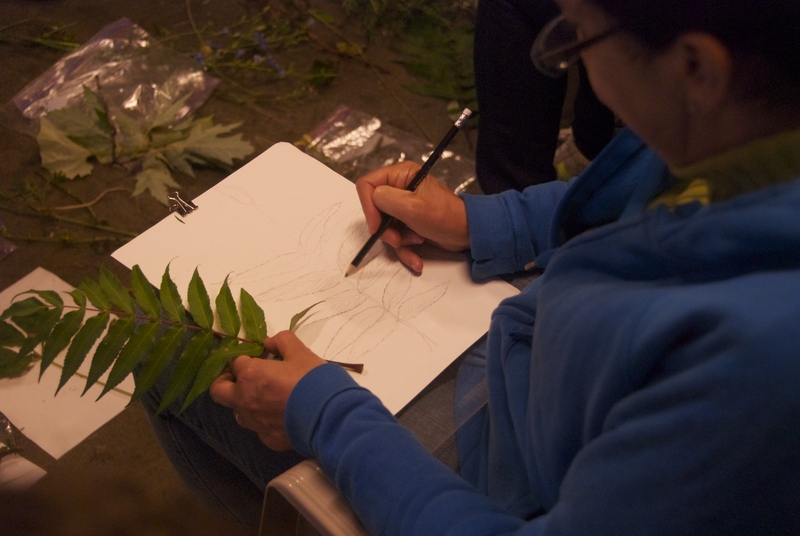 With guidance from Jessica, participants were then invited to reproduce their observations of the plant specimens through botanical illustrations and sketches. Participants at the Darling Foundry. Jessica Hart arranging the clippings. Photo: Shauna Janssen © 2014. 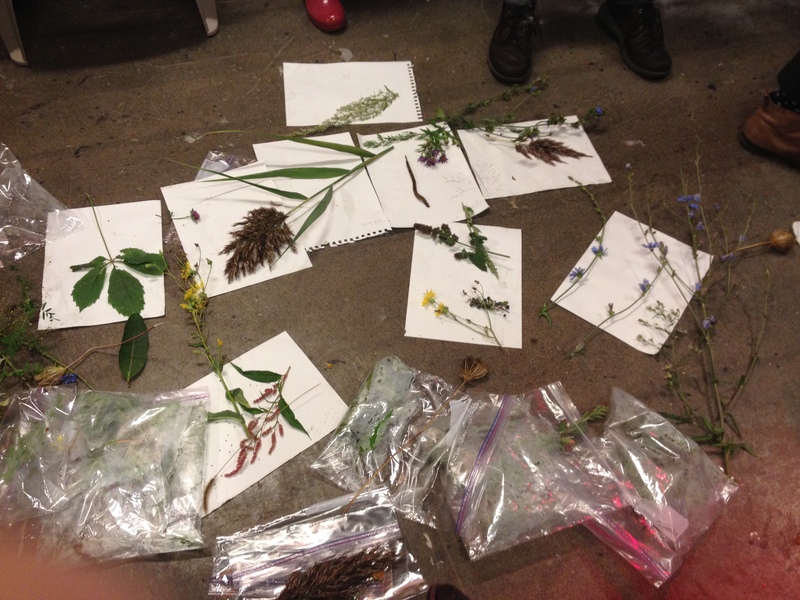 A sampling of plant species under observation. Photo: Cynthia Hammond © 2014. 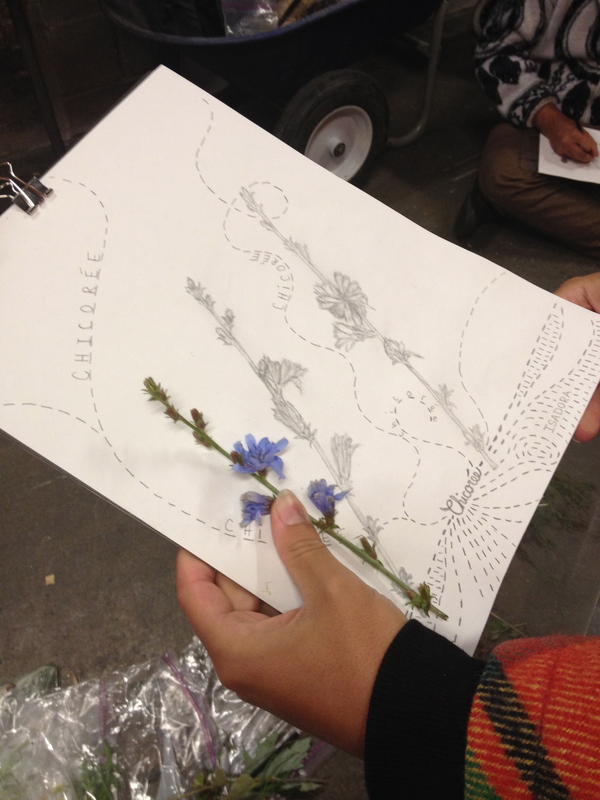 And the sketching begins! 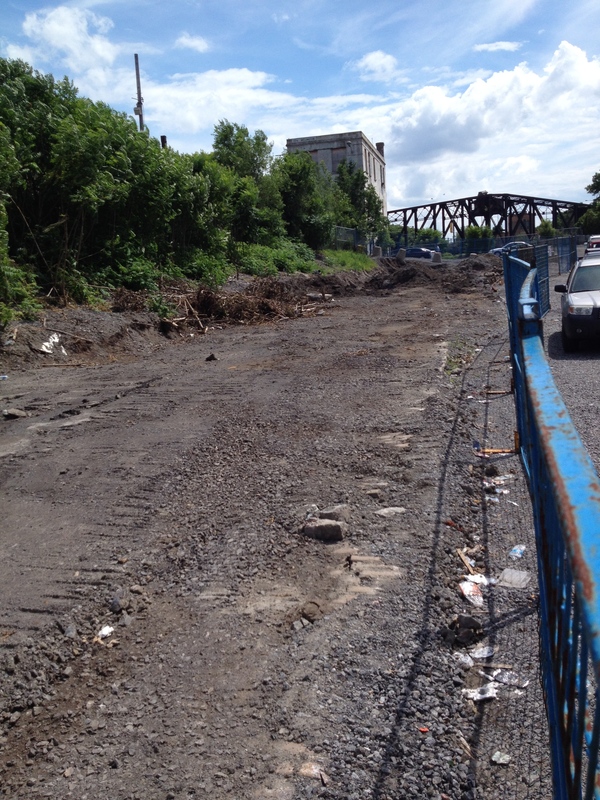 Photo: Roger Latour © 2014. Artist sketch. Photo: Cynthia Hammond © 2014. Eman Haram sketching. Photo: Shauna Janssen © 2014. 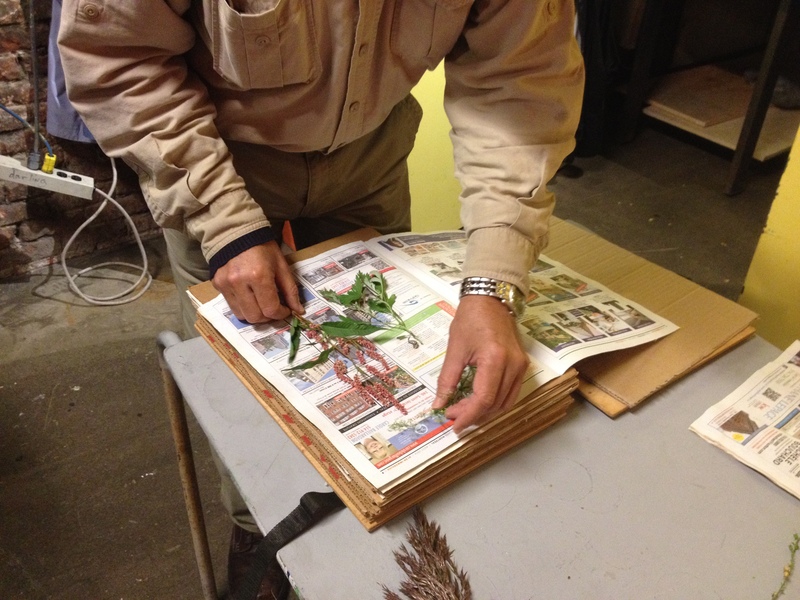 Roger pressing plant specimens. Photo: Shauna Janssen © 2014.